The latest installment in the Jack Reacher series, JACKREACHER: NEVER GO BACK, misses something. Mind you, it’s better than the first film in the series which introduced Lee Child’s literary hero. However, it lacks some fundamental element – zip – for the actioner it wants to be. Reacher’s the unconventional hero in some respects – having abandoned his career as major in the Army military police – and living a life without roots. He’s a mystery man going from spot-to-spot wherever he finds trouble or wherever it finds him. This time around, Reacher’s only looking for dinner with the person who now has his job. After cleaning up a particularly nasty situation on an army base involving human trafficking, Reacher becomes friendly with Maj. Susan Turner (Cobie Smulders of HOW I MET YOUR MOTHER fame) after helping her with a couple cases. He decides to stop into Washington D.C. to meet her face-to-face only to discover that she’s been arrested for espionage related to an investigation she was heading into shady dealings in Afghanistan. Of course Reacher immediately goes into cop mode and suspects that Turner is innocent of the chargers. However, strange things begin to happen when he starts to make inquiries into her case. Someone doesn’t appreciate it, and soon Reacher finds himself framed for a series of murders related to Turner’s case. After the first, there’s only one thing for him to do – break Turner out of military custody so they can solve the mystery of what exactly is happening. For an action film, director Edward Zwick (GLORY, THE SIEGE) proves economical with showing the violence on screen. There exists moments when he could revel in it. He chooses restraint, probably for ratings considerations. He and fellow screenwriters Richard Wenk and Marshall Herskovitz, defer to Child’s literary creation. The movie, however, creates a feeling that the film wants to break that chain just a little bit. 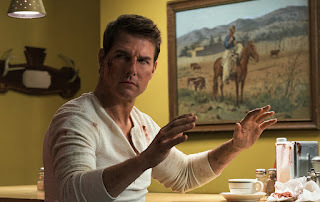 Given that Child is deep into the Reacher mythos in this installment, it makes sense that the filmmakers sacrifice some action for showing a character that’s matured in some ways. Cruise goes with that, and given that the (Still? Former?) superstar isn’t the kid who slid across a hardwood floor in socks, tighty whiteys, and Ray-bans in RISKY BUSINESS, he’s probably cool with inhabiting a different kind of action character. In his case, it works. NEVER GO BACK is also helped by the fact that Smulders has a bit more appeal than the female lead in the first Reacher film. No, I can’t name her either. Like most films in the genre, JACK REACHER: NEVER GO BACK indulges some of the worst clichés and impulses. For a weekend night away, however, don’t overthink it.